1. To preserve and strengthen those kind and fraternal feelings which bind together the soldiers, sailors and marines who united to suppress the late rebellion, and to and to perpetuate the memory and history of the dead. 2. To assist such former comrades in arms as need help and protection, and to extend needful aid to the widows and orphans of those who have fallen. 3. To maintain true allegiance to the United States of America, based upon a paramount respect for and fidelity to the National Constitution and laws; to discountenance whatever tends to weaken loyalty, incites to insurrection, treason or rebellion, or in any manner impair the efficiency and permanency of our free institutions; and to encourage the spread of universal liberty, equal rights and justice to all men. Soldiers and sailors of the United States Army. Navy, or Marine Corps, who served between April 12, 1861, and April 9, 1865, in the war for the suppression of the rebellion, and those having been honorably discharged from there after such service, and of such State regiments as were called into service and subject to the orders of the U.S. General officers , between the dates mentioned, shall be eligible to membership in the Grand Army of the Republic. No person shall be eligible to membership who has at any time borne arms against the United States. The following information was taken from The Detroit Tribunes Veteran Soldiers and Sailors Hand-Book Copyright 1889. Commander C.H. Smith- Mt. Pleasant. Senior Vice-Commander W.D. Thayer, Jessup. Junior Vice- Commander- R.A. Warham Mason City. Medical Director- J. W. Tiffany, Carter Point. Assistant Adjutant-General- T. A. Bereman, Mt. Pleasant. 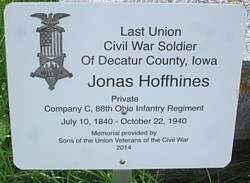 The Department of Iowa was organized Sept. 26, 1866 at Davenport, when J. B. Locke was elected Commander. It then had 45 posts and about 350 members, it now has 408 posts with a membership of 19,400. Encampments are held in April of each year. June 1933 to Aug. 1935 Frank L. Quade, Louis J. Leech, Horace B. Kelly, Jonathan C. Hanes Asst. Adj. Gen. Copyright © 2016 IAGenWeb.org. All rights reserved.